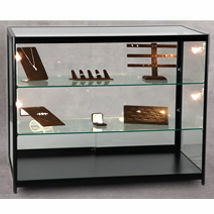 Make your high-end merchandise shine with the Lighted Display Case. Not only will your beautiful products stand out, they will be even more radiant under 8 halogen lights. 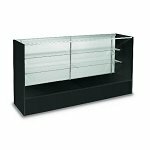 Constructed of black aluminum with tempered glass panels, this display case will fit any established theme. Rest assured your merchandise is safe and secure with the security lock. 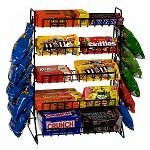 Adjustable shelves allow you the ability to make sure your products fit properly. This display works perfectly in retail settings, salons, and more. The lighted display case ships fully assembled which means all you have to do is plug it in and place your merchandise inside. Order yours today.